The LG K7 is available for purchase since May 2017. The unit features a 5.0 inches touchscreen panel with an 8 MP embedded primary camera. The system runs on Android Marshmallow OS and has 1 GB RAM. LG K7 is powered by a MediaTek MT6737M chipset and features 8 GB of onboard storage. If you are looking for standard specs and budget, this phone is ideal to buy. This article lists the 10 best cases for LG K7. Keep your phone fully protected and in style with JD. The case is made dual-layered; a polycarbonate clamshell layered with a shock-absorbing thermoplastic urethane holds your phone. The precise cutouts allow easy access to all phone’s functionalities. The textured back offers a firm grip and makes the unit anti-scratch and resistant to finger and hand prints. Specially designed for LG K7, this is also a dual-layered case that features an outer polycarbonate shell that is lined with thermoplastic urethane layer. The PC protects against scratches, scrapes, dust, debris, daily wear, and tear while the TPU defends against shocks and drops. The unit is made form-fitted for an exact fit. The cutouts have larger port openings for compatibility with large headphone jacks like Beats. This is a hard acrylic back cover case that features TPU bumpers. Your device is protected in style from scratches, scrapes, dust, debris, daily wear, and tear. Easily snaps on and off and is also available in Rose Gold and Mint colors. Made compatible with LG K7, this is a hybrid of plastic and TPU that provides foolproof protection to your device. The case comes with an integrated card slot to store your cards. It is made odorless and eco-friendly while providing excellent shock absorption and scratch resistance. Offers a firm grip, compact look, and light hold. This is a dual-layered case featuring an outer polycarbonate shell and an interior TPU shell that protects your device from scratches, scrapes, dust, debris, daily wear, and tear. Compact and stylish, your device is protected from bumps, impact shocks, and drops. The corners are reinforced to protect this most vulnerable part of your device. This case by TabPow offers full body protection for your device without adding any bulk. Ideal for those who want to maintain the phone’s look and feel. The 0.3mm thin case comes with the raised bezels to prevent the screen from smearing when placed face down. Precise cutouts allow easy access to all camera, buttons, and ports on your device. Also available in gunmetal gray, rose gold, and gold colors. 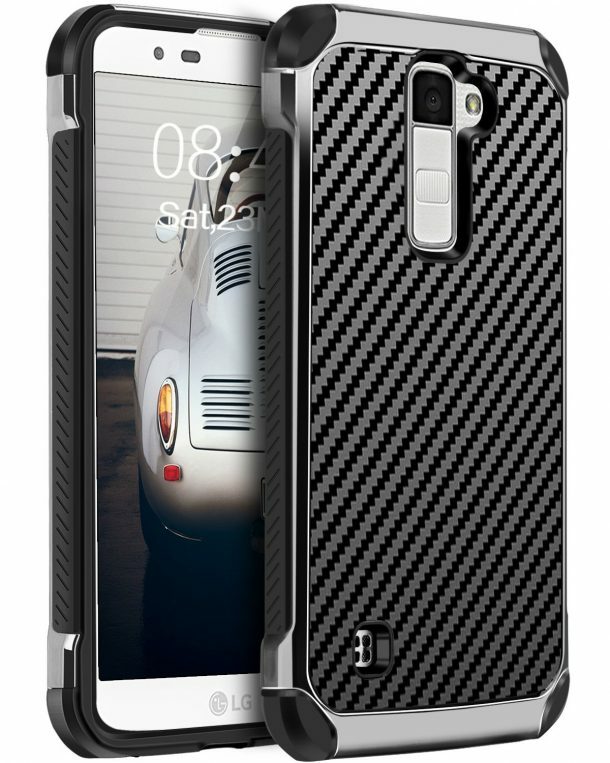 This is also a dual layered case (PC and TPU) designed with two layers that help to absorb the shocks from falls and drops while protecting the device. Built in kickstand allows hands-free and comfortable viewing angles, ideally for the wide-screen movie and video viewing. The case provides precise cutouts to access speakers, camera, microphone, charging ports, audio ports, and all buttons. This is an anti-slip back cover case that offers a snug fit to your device and keeps your phone safe from drops and shocks. You are offered full front and back protection with raised bezels that prevent the screen from smearing when placed face down. Easily snaps on and off and perfectly aligns with all the buttons, controls, and ports. 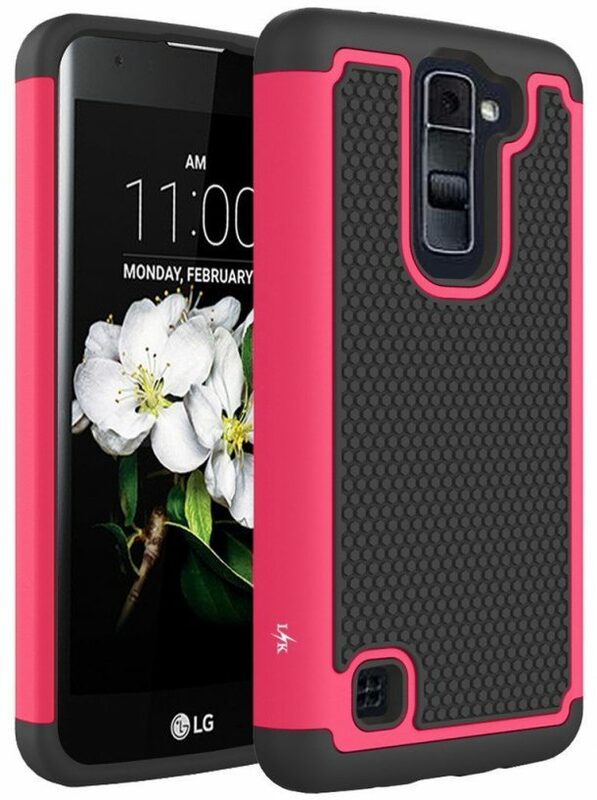 Exclusively made from LG K7, this case by JD will keep your phone protected and modish, all in one! With the alluring TPU rubber skin, the case offers anti-slip and smooth hand-feel to the user, along with protection from scratches and drops. The precise cutouts offer easy access to all functions. The sleek and slim body makes your phone a compact system to hold. This is a form-fitted hybrid case made from a combination of PC and TPU. Precise cutouts allow for improved access to all ports, buttons, cameras, speakers, and mics. The interior shock absorbing pattern minimises the impacts from drops as well as reduces heat via improved airflow. Raised bezels protect the screen and the camera.